How did "That Was Then, This Is Now" end up being recorded by the Monkees? Micky Dolenz asked me about this recently - how it was that my song ended up getting to them. I told him that it was just luck. He said, "You know, luck is where preparation and opportunity meet." million selling record "That Was Then, This is Now"
hotel room. Any of you young bands would know the drill about that. So finally it paid off. I had a group back then called the Mosquitos and Arista Records was semi interested in us and then I guess ultimately they passed, but they liked one of the songs on my EP called “That Was Then, This Is Now, ” in fact it was Clive Davis who heard it, and they picked it to be the Monkees comeback single. So it was really, really, really the stars aligned. Read more here: The Monkees 20th Anniversary Reunion Tour. 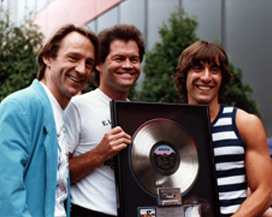 Watch a video of the August 1987 event in the photo: Vance Brescia with Peter Tork and Micky Dolenz. When Micky Dolenz is on the bill with Herman's Hermits I often join him on stage for the song. In 2009 I	was	in the band that backed Micky on the Teen Idols Tour and sometimes I fill in on bass with Micky's band. For best results use Microsoft Internet Explorer - allow scripts to run & allow pop-ups.